From Auckland Star, 29 March 1939. 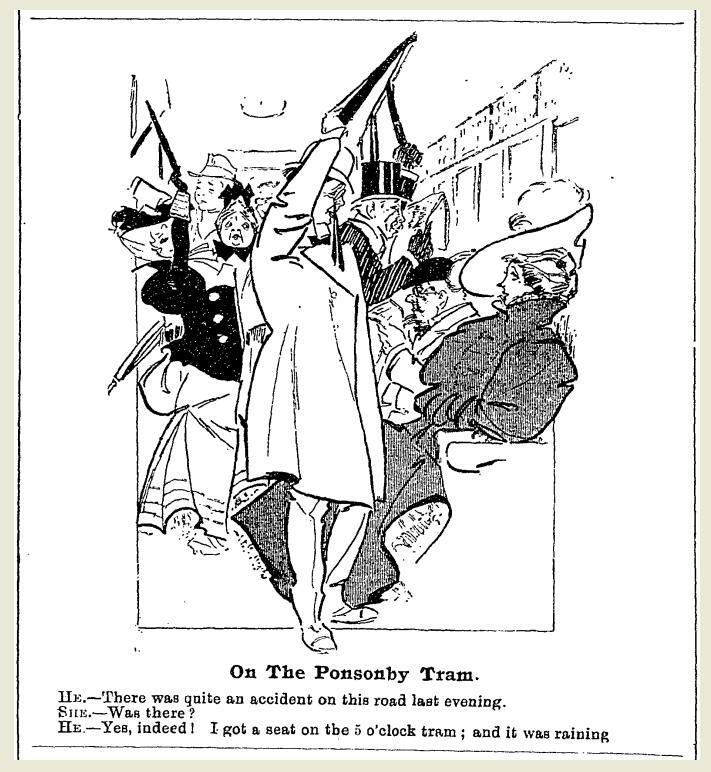 In the old days when horse-cars were the means of public transit in Auckland, conductors and drivers were jolly men. A blue strip slip for a twopence fare. The first horse-drawn tramway to be completed was the line from the Waitemata Hotel [Customs/Queen Street] to the Ponsonby Reservoir, and service commenced on August 11 1884. It continued until Auckland's electric tram system was inaugurated on November 17, 1902. The reservoir tram took the route by way of Wellesley Street West, Hobson and Pitt Streets, and was later extended to Three Lamps, Ponsonby, from where a one-horse "jigger" service supplied a penny ride to Wallace Street. The only other service -- which came later -- was by way of Wellesley Street East, Symonds Street, Khyber Pass and Newmarket to the present Epsom tram barns. The first horses used for drawing the trams came from Wanganui and were a fine team, all possessing good blood and breeding. Later horses suitable for the work were bred in the Waikato until the late 'nineties when they were imported from Australia. As the Australian horses cost only £1 per head plus £1 for freight, the New Zealand horse trade was killed. These horses were wild and unbroken, having been driven straight in from the Queensland runs. Trace horses were used in Wellesley Street to assist in drawing the heavily-laden cars up the grade, the animals being well fed on chaff, oats and bran with crushed maize or crushed pease, a ration of 15lb being allowed each horse each day. The drivers had whips called "spring tops" made of cane, whalebone and whipcord, which made hair and hide fly. On both routes, towards the finish of the horse-car days, a total of 34 cars and 12 buses were used. At first there were two double-decker cars but, owing to their extra height and short length, it was feared that in case of a sudden stop on a heavy grade they might capsize, killing or injuring either passengers or horses. For that reason they were discarded. The largest cars were licensed to carry 22 passengers inside and seven on each platform, but sometimes, especially at times of race meetings or football matches, the cars were so crowded that passengers climbed onto to and rode on the roofs. There were no uniforms as we know them to-day, and every man dressed as he pleased -- or rather, as his wife pleased. The conductor blew a whistle to stop or start the cars, which could pull up anywhere for passengers, as there were no regular stopping places. Bad weather was a trial in those days. It was reasonable enough for the passengers, who were protected by the blinds let down when the rain came on -- but the conductor earned his money, as he had to crawl around the outside step, lean in and reach across to collect the fares. Many of the "old-timers" are still in the service of the Auckland Transport Board. Mr S M Farrelly, who joined the service in 1898, is stores supervisor at headquarters. The chief inspector, Mr G S Elliott, is another horse-car veteran. Among others still in the service are Messrs T Auckram, W J Kirkwood, C Halley, W Neville, J A Hearling, E Watson, J A Beacham, Charles Burns, and W St John Clarke. Other members, since either retired or in other lines of business, are W Richardson, W Haynes, A McGuire, Henry Reid, A H Olney, J Glynn, P McElwain, O Jensen, C A Harris, E Street, C Nankurvis, T H Collecutt, George Fowler, H Fulcher, S Rosser, T J Parvin, A P Caddy, G T Parvin, T A Johnson, W J Kidd (whose father was once manager of the tramways company), Colin Stichbury and James Cox -- all of Auckland. J Gorman, another ex-employee, is now in Sydney.